Pugsley's Marsh-orchid is a spindly plant growing to between 10 and 40cm in height. There are 3-5 narrow, unspotted leaves growing from the base of the plant. The upper part of the stem is washed purple, and the flower spike is small with relatively few (generally around 10) large flowers.The flowers are usually a purplish-pink colour and have pronounced darker markings consisting of spots and loops. The lip of the flower is three-lobed. Notoriously difficult to indentify, this orchid isoften confused with small specimens of other orchids including Northern Marsh-orchid Dactylorhiza purpurella and Early Marsh-orchid Dactylorhiza incarnata. This rare orchid is found in the British Isles in far-flung localised colonies. The Anglesey Fens National Nature Reserves in North Wales have a number of plants growing in very wet reed beds. The Burren in County Clare, Southern Ireland, is also a reliable place to find Dactylorhiza traunsteinerioides where it grows along with the Leopard Orchid Dactylorhiza incarnata subsp. cruenta. A small inflorescence with a few large conspicuously marked flowers are typical of this rare orchid. The Narrow-leaved Marsh-orchid growsin calcareous marshes and wet meadows. 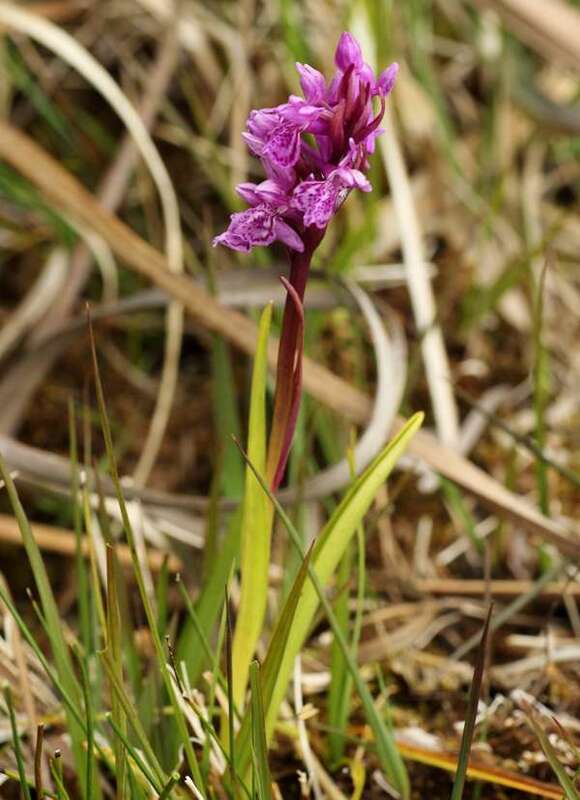 In the Anglesey Fens this orchid is able to survive because of the alkaline flushes which filter down through the limestone rocks in an otherwise acidic area. In Wales the Narrow-leaved Marsh-orchid comes into flower at the same time as the Early Marsh-orchid Dactylorhiza incarnata. 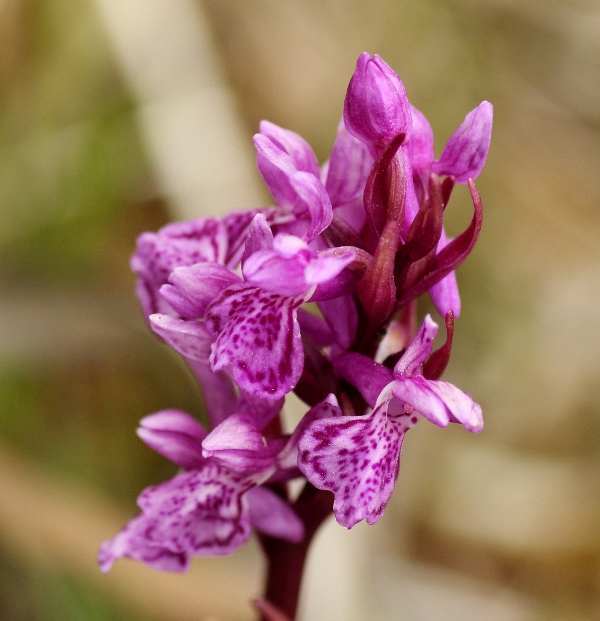 Late May and early June are the best times to see it in the Anglesey Fens, whereas in The Burren the Narrow-leaved Marsh-orchid usually flowers in early June. Pierre Delforge (2005) Orchids of Europe, North Africa and the Middle East; A&C Black. This page iuncludes pictures kindly contributed by Elaine Hagget.